One thing that I love about working in the Peninsula is the great, cheap eats that are close by. I love to eat at sit down places where I can just sit and talk to my coworkers about random things like Glee and P90X, but when we’re down for some awesome, fast mexican food we go to Tacos Peralta. It’s not a Taqueria, it’s what people call a roach coach. However, it’s not one of those trendy food trucks that serve Fancy Desserts or Gourmet Sandwiches. This one has been in the same spot for the last couple of years that I’ve been coming here. Nestled in front of a BevMo and gas station, this is probably the best place to drop a food truck, especially one that has these long lines which requires ample parking space. When I come here I always get the Tacos. Can you believe they are $1.25! The best part is you get your choice of awesomely flavored and cooked meat. I started experimenting with every type of meat they had on the list: Carnes Asada, Pastor, Cabeza, Lengua, Pollo, Tripa, Chorizo, and Carnitas. My favorite by far is Cabeza. Yeh, for all you non-Spanish readers, that’s head. There’s something about the way they grill the head meat, and there’s nothing wrong with eating it if it tastes awesome. 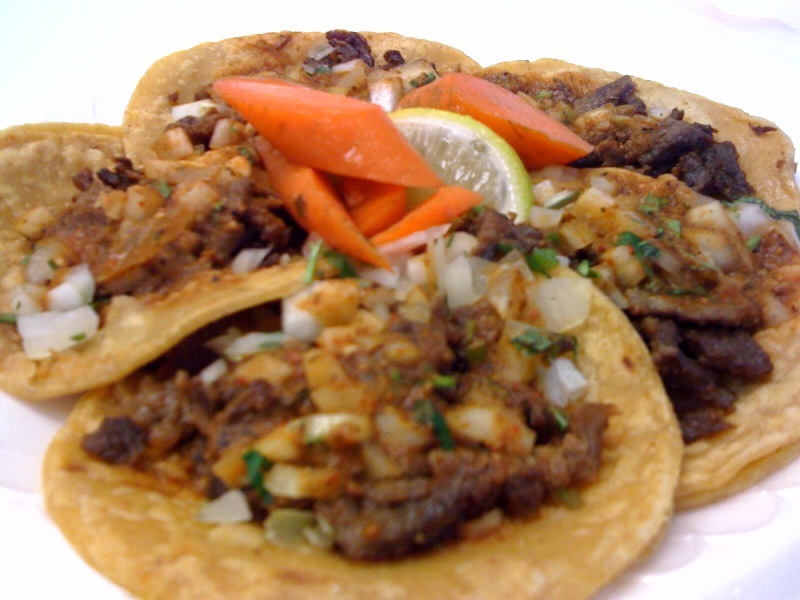 The meat is placed on top of corn tortillas, mixed with onions, and some hot sauce with pickled carrots, and a lime on the side. I’ve given their Quesadilla a try, but I felt that my heart has fallen for the tacos. Quesadillas are $4 and are pretty much the same, except they use a flour tortilla and add cheese. So, the truck is always in front of BevMo, and there’s always a line during the main dining hours, rain or shine. There was once a time where a different truck showed up instead of Tacos Peralta, and my dining companions and I had a little tear. Three grown men, crying on the side of a road (a little more than a tear, I guess). Well, all in all, this is just a taco truck, and people shouldn’t go there. I just want to keep the lines really short.